This statement could not ring more true as a representation of my childhood and adolescent experiences that have streamlined my career path and shaped the person I am today. Learn more about Victoria Sagrera, our newest staff member! I grew up in Vermilion parish, just north of Intracoastal City and south of Abbeville, in area locally known as Mouton Cove or Big Woods. Historically, my family made a living from the fur trade by selling the pelts of nutria, muskrat and other abundant fur-bearing wildlife while also taking advantage of the over-population of alligators. They hunted migrating waterfowl, made use of feral hogs, and fished every available opportunity, whether it was for payment or recreation. Not much changed over time, except for the focus shifting from trapping, after the decline of the fur trade, to farming. My family’s lifestyle, like most along the coast, was dependent upon the land, the coast and its natural resources. Being born into this deeply-rooted coastal family of farmers, trappers, hunters and fisherman certainly impacted me from the get-go. Marsh between my toes, sitting on posts while dangling my boots over the side of cattle chutes, being my grandfather’s shadow around the rice bends, eating cold sandwiches because food was not worth getting out of the combine while cutting rice, feeding the horses sugar cubes – and a few extra when no one was looking, cold mornings on crawfish boats praying there were no snakes in any of the traps, knowing every trout hot spot before I was (legally) able to drive, seeing hogs peek through the marsh grass as we rode in the boat – this was my childhood. 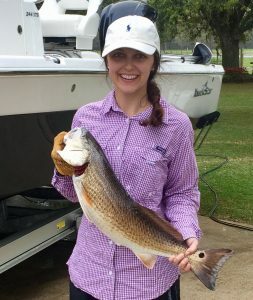 I am the first, and still the only girl, of six grandchildren within the Sagrera/Hebert family to be born into this unique way of life that resonates with the vast majority of coastal Louisiana residents. The term “working coast” could not be more true for our state, especially when you come from a family whose livelihood solely relied upon the health of our coast, wetlands and community ties. Throughout the years, I have personally witnessed the monumental changes our wetlands and coast have undergone which fuel the direct connection I have to advocating for our coast. Having grown up with coastal wetlands (literally) in my backyard, I understand firsthand how critical the restoration of our land is to the success of sustainable coastal environments, as well as the richly intertwined culture.